Johnny's the one on the right! This’ll be interesting. Formula 1 comes to Motherwell of all places. On the 5th of May, Johnny Herbert will be coming to the steel town’s Concert Hall to talk about all things Formula 1. Currently Sky TV’s Grand Prix presenter, Johnny won three Grand Prix races during a 160-race, F1 career which spanned the years 1989-2000, including that fairytale British GP victory at Silverstone in 1995 in a Benetton. For this sole-Scottish, Motherwell leg of a UK tour, Johnny has created an audio-visual presentation, but will also chat with the audience on the subject of all things racing and F1. Topics will include the new Regulations which were introduced for this season and the new Regs coming next year, and no doubt he will have a view on that controversial finish to the Malaysian GP. A highlight of the one night show is a genuine F1 car on the stage and during the evening a raffle will be drawn to give one lucky winner a chance to sit inside the car. This has the potential to be a particularly embarrassing event given the dietary habits of the battered fish, pizza crunch, pie supper-fed Lanarkians. That is unless any vegetarians show up. 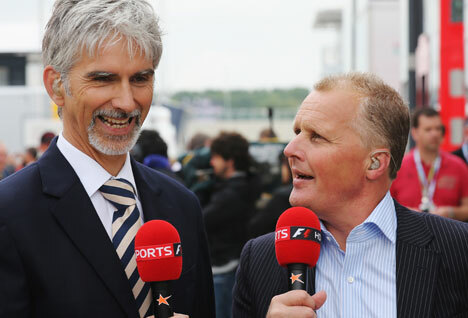 The ‘Evening with Johnny Herbert’ at Motherwell Concert Hall starts at 7.30 pm on the evening of Sunday 5th May with tickets costing £20 or £18 concession.